Well, let me introduce you to a new SEO tool called "Blogging Ninja." 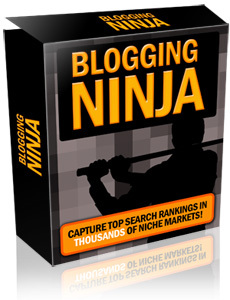 Blogging Ninja is a web based software script that allows you to automatically gain fresh, relevant content in your own personal blogs. It works by using the power of RSS (Really Simple Syndication) to allow you to offer your readers fresh content from blogs and news sites around the web. Best, of all, you don't have to pay a dime for this content because it is readily available for the public's taking. You Just Set It Up Once For Each Blog and "Presto"… You're Done! This PHP script normally sells for $97.00 but you pay an incredible $1.00 here!